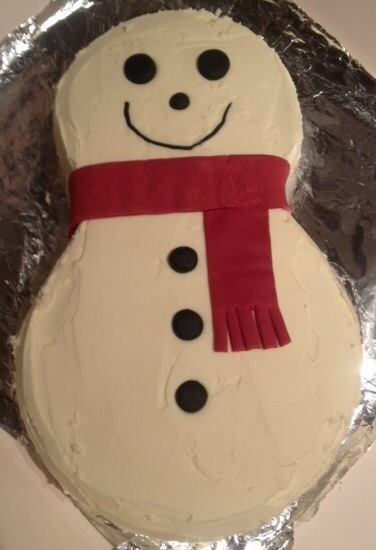 Talking of ever so cute cakes … awww, this snowman is just the most adorable thing. And the best thing about volunteering for us for baker Anna? She gets to lick the bowl! Yum yum! Five eggs; then same weight as eggs of self-raising flour, sugar and butter. One or two teaspoons of vanilla extract. Heat oven to 180 / 160 if fan. Cream butter and sugar until light and fluffy. Add eggs one by one, mixing thoroughly as each is added. Add vanilla extract. Sieve and fold flour into the mixture carefully without knocking the air out or over mixing. Divide between two tins and bake for 30 minutes until springy, but keep an eye on them after 25 minutes. Allow to cool and make buttercream by mixing the ingredients together. When cake is cool, cut one cake into a smaller round for the head (unless you’ve baked in two different sized tins), then cut an inch of cake off each round so one can sit on the other. Lather it in buttercream, inside and out if you like. Smooth the outside with a scraper and get it as neat as you can. Give your snowman a face with sweets, liquorice or coloured icing for eyes, nose and mouth. Make a scarf by rolling out two strips of coloured icing, cutting into one end for the authentic frayed scarf look. Make a hat or anything else you fancy. Doesn’t he look nice? Now EAT HIM. I’m a DJ and work from home so it’s easy for me to whip up a cake during the day. Plus I get to lick the bowl after and everyone knows cake mix is the best bit of this whole baking process. FCFK Hackney is such a great charity and idea and it’s so nice to be part of it and make something fun to be enjoyed at a celebration. My decorating may not be Great British Bake Off worthy, but the cakes always taste good!